Man wearing virtual reality goggles and gesturing in front of a computer. 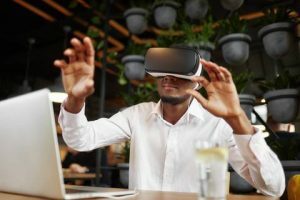 There’s been much buzz over the past few years around the potential for Virtual Reality (VR) to treat a host of addictions, but it hasn’t yet taken hold as a standard treatment modality—more research and greater technological accessibility is necessary for this to occur. But as the number of deaths from opiate overdose continues to climb despite the ubiquity of inpatient and outpatient rehabs and parity for addiction treatment under the Affordable Care Act, continual innovation in the field of addiction medicine—and perhaps disruption—is arguably needed. VR therapy typically involves exposure to a particular set off triggers and stressors—known as “cue reactivity,” and this exposure takes place while patients are in the company of a clinician, allowing them to face trauma, fears, or triggers while learning coping or relapse-prevention skills in a safe environment. Though VR therapy is certainly having a moment right now, its study in the treatment of psychological disorders is not new. Dr. Albert “Skip” Rizzo, a pioneer in the field of medical virtual reality, began using VR to treat war veterans with PTSD back in the 1990’s at USC’s Institute for Creative Technologies. Over the years, his work expanded to study and treat other mental health conditions such as depression and schizophrenia. Another pioneer in the field, specifically in the field of addiction treatment, is Dr. Patrick Bordnick, Dean at Tulane University’s School of Social Work at the University of Houston. Back in 2004, he proved that VR can generate cue reactivity in smokers, and he subsequently performed an experiment testing the efficacy of VR to treat nicotine addiction, finding that participants who received VR therapy in tandem with nicotine replacement therapy smoked less than those who received nicotine replacement alone. Now, he’s trying to tackle opioid addiction by creating virtual rooms that he dubs “heroin caves” to trigger cravings in opioid addicts. Patients are then walked through these scenarios with a clinician who gives them a skill set to deal with the impulse to use. Psychoeducation is the root of Bordnick’s VR therapy. Standard roleplaying scenarios between a patient and therapist wherein they envision triggering scenarios and discuss potential skill sets don’t prepare patients for the emotions and physical responses they face when experiencing environmental triggers. Bordnick’s recognition of traditional therapy’s limitations motivated his VR research—he wanted to create a way to teach patients coping skills and relapse prevention while they engage in immersive realistic environments that trigger visceral cravings. Two decades ago, the average consumer couldn’t afford either a VR headset or the super-powered computer necessary to create a virtual world in her or his home. Though some VR headsets certainly aren’t cheap, today’s consumer can buy a decent one for a couple hundred dollars, and it’s possible to power these worlds from a standard computer or Smartphone. While researching the benefits of VR in the treatment of nicotine addiction at the University of Georgia over a decade ago, Bordnick constantly lamented that the technology was not accessible to all who needed treatment. Bordnick is also exploring other technologies to treat addiction, including geomapping—programming your phone to alert you when you’re nearing an area where you’ve relapsed before so you can be extra mindful and use a set of skills to resist using. Given the burgeoning affordability of VR technology, it’s a fair guess that many people will be able to set up VR systems in their own homes—or even outside of their homes, through portable devices—and this cracks open other possibilities to capitalize on the technology outside of the clinical setting. Noah Robinson, a psychology researcher and Ph.D. candidate at Vanderbilt University—and former gaming addict—has reimagined the use of VR for treatment for addiction, moving outside the use of cue reactivity. While much of VR therapy is intended to be used in a clinical environment and with the participation and guidance of a therapist, Robinson hopes that the technology can be used in someone’s home at any moment to interrupt a relapse. He is working at the rehab facility Journey Pure to develop the technology, which is supported by Vanderbilt’s center for innovation called The Wondr’y. Robinson is utilizing a platform called VRChat to calm distressing emotions in users by immersing them into tranquil environments. The platform is community-based and open-source, and anyone can create and upload a virtual world. In some ways, Robinson’s work does the opposite of Bordnick’s—the virtual world soothes rather than triggers. Within the worlds, Robinson wants to create social networks, so instead of entering the VR rooms alone, people would be able to interact with multiple users who are in recovery. His VR therapy is desktop-based, which is more costly than mobile-based VR—the setups can cost around $1,300 to $1,400. Once the therapy has been proven to prevent relapse Robinson hopes insurance companies will subsidize the cost so anyone can have access to the treatment. It makes sense that Robinson, as a former gaming addict, would capitalize on the potential benefit of social networking within VR, as connecting with other people within a virtual world is a major benefit of gaming. Massive Multiplayer Online Games (MMOG) such as World of Warcraft and League of Legends allow you to engage with other players at any time of the day or night, no matter where you’re located on the globe. Plenty of friendships—and even marriages—have spawned from such connections. The key word here is “immediately.” Though it’s true that anyone experiencing a craving can seek out social support via a mutual support meeting or just a friend or relative, it can take some time to make that connection, and sometimes it might not happen at all. Cravings can hit hard, sometimes out of nowhere, so the more accessible the social support, the better, and combining this with an experiential shift through an immersion into a tranquilizing environment might be powerful enough to beat the craving. Robinson’s treatment methodology is still in the research process, so it’s not available yet, although he has found that using VRChat can decrease negative emotions and increase positive emotions in users he’s studied. It’s natural to wonder if this at-home VR treatment might lead to an addiction to the treatment itself and thereby a withdrawal from everyday life into a virtual world. But Robinson doesn’t think this is likely. In addition to using VR to treat opioid addiction, research has shown that the technology is successful in treating pain, which may stand to put a dent in the opioid addiction problem, although some experts (and many sufferers) argue that a backlash against the prescription of opioids for pain is reckless and inhumane toward those suffering from conditions that require palliative intervention. Still, for those with addictive pasts who want to play it safe—and even for those without—pain relief via VR might prove to be an effective alternative. Both Bordnick and Robinson emphasize that they do not see VR therapy being the only means to treat addiction; instead, they see it working best when included in a multi-modality treatment plan, and both of them stress the importance of creating strong social support networks, be they through peer support groups like SMART Recovery, Women for Sobriety, AA, or Refuge Recovery, or just close family and friends. When facing something as stubborn and potentially lethal as opioid addiction, it certainly makes sense to throw as many therapies at the problem as possible. VR therapy adds another one to our arsenal. Noah Robinson is looking for people in recovery to participate in his research of VR therapy and social networking through the app Discord. Visit his website if you are interested—www.psychnoah.com.